Pope Francis has proclaimed Archbishop Thomas Cranmer a Doctor of the Universal Church in recognition of his bold witness of faith and his contribution to divine worship and liturgy. Last year members of the Personal Ordinariate of Our Lady of Walsingham, which reserves elements of a distinctive Anglican patrimony, implored the Holy Father to authorise the opening of the process so that the name of Thomas Cranmer might be added to the list of ‘Doctors of the Church’. Pope Francis, having long been sympathetic toward the Church of England and to Anglicanism, has now acceded, thereby indicating that the Book of Common Prayer is considered to offer key theological insights for the Christian faith. The proclamation is not in any way an ex cathedra decision, nor does it even amount to a declaration that no error is to be found in the teaching of the Doctor. It is, indeed, well known that the very greatest of them are not wholly immune from error, and Cranmer is no different. 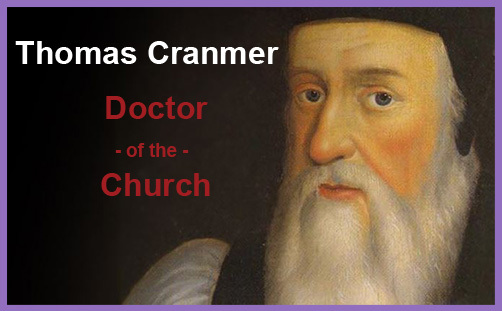 Archbishop Thomas Cranmer brings the number of Doctors of the Church, recognised for their contribution to theology or doctrine, to 37. He is the fourth to be given the rare honour this century, following St John of Ávila, St Hildegard of Bingen, and St Gregory of Narekboth. He is also the first martyr to be included in the list.